For a position that is often associated with quick bursts of energy followed by a whole lot of standing around and watch, there's certainly plenty going on in the Phillies outfield. Unlike the infield, there are jobs for the taking -- or perhaps for the losing -- as Dom Brown tries to battle back from an awful 2014 campaign and young players like Odubel Herrera and Aaron Altherr look to make the big-league roster. Sure, the projected starting trio of Brown, Ben Revere and Grady Sizemore is a far cry from guys like Shane Victorino, Jayson Werth, Hunter Pence, Raul Ibanez, and Pat Burrell, but this isn't the late 2000s Phillies anymore. Think of this as the late 90s teams. It's going to hurt to watch, but in a few years -- if you're lucky -- you'll look back on this era of Phillies baseball as the time that built the foundation for what came after it. Let's just hope that what comes next isn't an apocalyptic failure. Besides, what fun is spring training when there aren't any jobs on the line? And if you set your expectations for the 2015 Phillies in a realistic place -- meaning you resign yourself to the fact that they're going to be bad -- maybe someone will surprise you. Maybe you'll see a glimmer of hope in the form of an overachieving prospect. 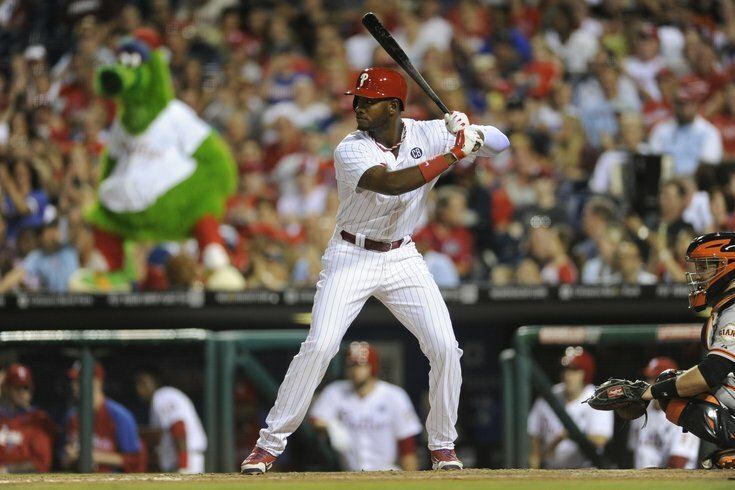 Maybe, despite what common wisdom suggests, Dom Brown will bounce back this season. The key, however, is to expect none of that to happen. Only then will you be able to enjoy it when it does. In any event, we'll roll out positional previews all week, as well as a look at the Phillies farm system and what to expect from the rest of the league, to get you ready for the baseball's return. Domonic Brown, RF/LF* - After making his first All-Star Game appearance in 2013, Brown was awful last season, hitting just .235 in over 500 at-bats. He'll likely be the starter in right field to start the season, but as the team continues its rebuild, Ruben Amaro and the front office will need to decide if Brown figures to be a part of the team going forward. In order to avoid arbitration, they signed Brown to a one-year deal earlier this offseason worth $2.6 million, a substantial raise over the $550,000 he made in 2014. Once the organization's top prospect, the 27-year-old outfielder has fallen mightily and needs to prove his worth this season, or it could be his last in red pinstripes. Ben Revere, CF* - Like Brown, Revere signed a one-year deal to avoid arbitration. Unlike Brown, however, Revere had a career year in 2014 and will make $4.1 million this season. After hitting .305 and racking up a league-leading 184 hits, you'll likely see him back at the top of the order. At just 26, there's a good chance he could sign a multi-year deal if he can have another year like he just did. Grady Sizemore, LF* - After being released by the Red Sox in June, Sizemore signed with the Phillies as a free agent and played well enough to earn a one-year deal to come back in 2015. He'll have to battle Darin Ruf and Aaron Altherr for playing time, but unless either of those guys have a monstrous spring, you can pencil Sizemore in as the starting left fielder. The main thing working against the 32-year-old vet is the fact that he's another left-handed bat in that lineup, whereas Ruf or Altherr hit from the right side. There's a chance you see a platoon of sorts, especially if manager Ryne Sandberg wants to ease in Altherr, who is only 24 years old. Darin Ruf, LF - Injuries plagued Ruf for much of last season -- he only appeared in 52 games, getting just 102 at-bats -- .and even when he was healthy enough to play, he struggled. He hit just .235 in 2014 after much better showings in 2013-14. He'll have to prove to Sandberg that he's worthy of getting significant time, but he does have one thing going for him. He's a righty. Unfortunately, so is the significantly younger Altherr. Remember when Ruf -- he hit 38 home runs in 139 games with double-A Reading in 2012 -- was supposed to be the power-hitting righty the Phillies so desperately needed? Aaron Altherr, LF - Altherr only got five at-bats for the Phillies in 2014, but expect to see more of him this season. Not only will there be chances for him to spell Sizemore in left, but don't rule out him taking some time from Brown, especially against lefties. But more likely, he'll spend some time in the minors before being added to the 25-man roster. Jordan Danks, OF - Not known for his hitting, Danks was picked up off waivers this offseason and figures to be a bench player this season. Despite the fact that he is currently on the 25-man roster, there's no guarantee the 28-year-old outfielder makes the big league club right out of spring training since he still has a minor-league option in his contract. Kelly Dugan, OF - Considering he has yet to play above the double-A level, there's a good chance Dugan doesn't make the 25-man roster and rather starts the season with the Iron Pigs. He's also yet another left-handed bat. Odubel Herrera, OF - Like Dugan, Herrera's never played anything higher than double-A ball, but because he's a Rule 5 pick, he has to stay with the team all season, or risk being sent back to the Rangers. Herrera also plays middle infield, so his versatility alone makes him intriguing. Brian Bogusevic, RF - Although he didn't play a single game in the majors in 2014, Bogusevic does have nearly 700 big-league at-bats in his career. Unfortunately, he's -- you guessed it -- another lefty. Jeff Francoeur, RF - He used to be good, but hasn't been a big-league regular in over two years. It'll be interesting to see what the Phillies can get out of Francoeur. Since leaving the Braves in 2009, the Phillies will be his sixth stop in as many seasons, which doesn't bode well. Roman Quinn, OF - He's been progressing nicely through the Phillies system since being selected in the second round of the 2011 draft, but there's no chance he's ready for the big leagues just yet. Expect to see him begin the season at double-A Reading, or perhaps Clearwater with an eventual promotion to Reading. Carlos Tocci, OF - The 19-year-old Venezuelan outfielder could make the jump to Reading -- along with Quinn -- after spending the last two seasons with single-A Lakewood. Aaron Brown, OF - Like Tocci and Quinn, Brown is not yet ready for the big leagues, but the progression he's made since being drafted in the third round last June has to be promising. He finished the 2014 season with Lakewood, where he hit .309 in 55 at-bats, including a home run and six doubles. It's do-or-die time for Brown, who has yet to put together a full season that would make you excited for what's to come. Domonic Brown’s swing, Phillies manager Ryne Sandberg said, was in a rut. His production slipped last season in almost every offensive category. A year after being an all-star, Brown was one of the league's worst hitting outfielders. This season, Sandberg said, is a new slate. If Brown can't get back to the player he was in the first half of 2013, it'll be interesting to see how much patience Sandberg actually has. Unlike in previous years, Ben Revere enters spring training as the unquestioned leadoff hitter, thanks to his .306 average last season -- but more importantly the departure of Jimmy Rollins. In 123 games at the top of the order, Revere managed to get on base about a third of the time and finished the year with 49 stolen bases. But Revere can't do it all by himself. Despite his league-leading 184 hits, Revere scored just 71 times. That's not exactly the kind of run production you want from the top of the order. As long as he's getting on base, however, he's doing his job. The rest is up to guys like Utley and Howard to drive him home. With Sizemore, Ruf and Altherr all presumably competing for playing time in left field this spring, it'll be worth paying attention to Sandberg's lineup -- or better yet, how that lineup relates to the dexterity of the opposing pitcher. Will Sandberg platoon guys in left depending on whether the Phillies are facing a lefty or a righty? Will Venezuelan Winter League MVP and Rooke of the Year Odubel Herrera break out and steal time from those guys? Could he (or Altherr) steal some time from Brown in right if he struggles? Here's the infield, but check out the full preview here. • Sandberg says the team will "have options" in right field, per Matt Breen of the Inquirer. • Corey Seidman of CSNPhilly.com writes that the odds of Brown bouncing back this season are slim. • Michael Stern of That Ball's Outta Here predicts the best and worst case scenarios for Brown in 2015. • Darin Ruf says that Darin Ruf can't afford any more injuries. • Ryan Lawrence of the Daily News talks about how young players will push the veterans in Clearwater. • Meghan Montemurro of the News Journal writes that Ben Revere, despite having a career year, was battling an ankle injury for much of 2014.